Keep the great sound and lose the cords! Wirelessly connect to your compatible mobile phone, and let Audionic Blue Beats Headphones bring you complete hands free freedom. Take it on a walk, or let every trip be accompanied by your favorite music. The setup is easy and once it's set up. The Audionic Blue Beats Headphones brings you wireless convenience and it is design without compromising audio quality. 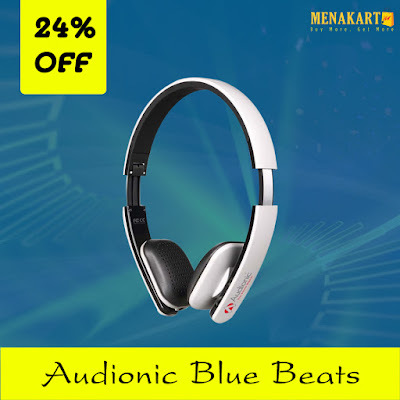 Offering clear and powerful stereo sound, the Audionic Blue Beats Headphones will do your music selection justice. The phone is your remote control, allowing you to change tracks and adjust the volume. And you don't have to worry about being out of touch. When the phone rings, the music mutes and you can take or reject the call.